Facebook is the largest social media network and almost everything gets shared onto it because of the vast area of the world its user base covers. It also provides a great amount of features to its users whether they may be the normal users or the business oriented ones. However, sharing some information from Facebook onto your Blogger blog was never thought of until recently when the Facebook posts embedding was included as a feature. So the old days when you added screenshots or URLs of Facebook content are gone since now you can directly embed the posts and users can also interact with it directly from Blogger. What you see below is not a screenshot but an actual post from Facebook and if you’re logged in on Facebook, you can also like, share or comment on it directly from here. So how does this post embedding work? The embedding supports any of the photos/videos, status updates or hashtags that are declared Public by the uploader. The process has not yet been finalized and is still under maintenance which is why only a few blogs can directly embed posts onto their blogs. But the others need not to worry since we got methods to make it work on any Blogger blog of theirs. So without further ado, let’s take a look at the How part, shall we? Embedding requires the permanent URL or permalink of the post. To extract that head over to address bar and copy the text while the required content is currently opened in the tab. 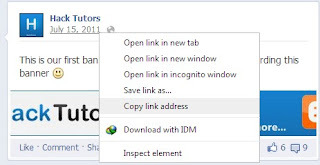 URL of a post can also be obtained by right-clicking on its Date/Time tag and copying the link address. The latter method is preferred. The code shown below is your embed code. The URL of the Facebook post that you extracted in Step 1 should be placed in place of the URL_GOES_HERE text. After that, the embed code is ready to be used. The HTML editor of a blogger post is where this code should go. Copy the final code and paste it where ever desired on the post. Facebook posts can directly be interacted(liked, commented on or shared) from a blog provided the viewer is logged in on Facebook. This proves to be a great way of sharing your Facebook posts where ever you desire and is expected to be made flawless in some days.